Kobe and Shaq, lions and tigers, and pumpkin pie and cheesecake. Stand alone, they are all great, but when combined, they are a force to be reckoned with! Shaq’s rebounding and blocking abilities made him a fierce competitor, but when Kobe came aboard the Lakers and brought along his strong midrange shooting and footwork skills, as if he had no other purpose in life, they were unstoppable. If they didn’t have personal issues they would have dominated the league! That’s the kind of forces we are talking about right now. In case you haven’t heard yet, lions and tigers have been bred together to create a beautiful large cat called a Liger. And yes, separately Lions and Tigers can run upwards of 40mph and are the two cats with the largest brain sizes of all cats, thus reaching maturity faster, but combined they become even stronger. The Liger now represents the largest known cat in the world and is a great swimmer like tigers with very sociable personalities like lions. Have you heard of anything more beautiful? 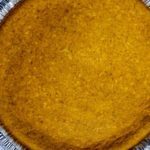 The greatest force of them all is something we over in the Keto Connect kitchen have created – Pumpkin Pie Cheesecake. Simply going off appearance, it looks like a cheesecake with the color of a pumpkin pie. Moving onto texture, it’s creamy like a pumpkin pie, but dense like a cheesecake. Finally, moving onto taste, I should start by saying its delicious! You get a kick of pumpkin puree in each bite as you would in any normal pumpkin pie, except you still get the sweet tart taste at the end as you would get from a cheesecake. And, believe it or not the best part is the nutrition! We know just as well as anyone that Thanksgiving isn’t the same without a pumpkin pie somewhere on the dessert table! We don’t care if it’s burnt to a crisp, or still jiggly in the center. If I don’t see it it’s not Thanksgiving! So, we knew we had to make it happen. The downside to Pumpkin Pie is the carb count – if you haven’t guessed yet it’s pretty high up there. So what better way to balance out a high carb pie with the ultimate Keto-friendly pie, cheesecake! Cheesecake is mostly (close to all) fat which makes it a great treat for us keto-ers. And, when combined with a pumpkin pie, to create a Pumpkin Pie Cheesecake, you get all the flavor and less than half the carbs. It’s honestly the biggest win-win of the day! It trumps Kobe’s footwork and a lion’s sociable personality. It’s so simple to make for Thanksgiving this year that we’ve created a video (above) showing you the exact step by step process. The video also has our Low Carb Pecan Pie which is another must at Thanksgiving. If you’re a fan of the two most delicious pies and want to enjoy its beautiful baby hybrid, Pumpkin Pie Cheesecake, on Thanksgiving this year check out the video and let us know what you think! Better than Kobe and Shaq, and Ligers, am I right or am I right?! Combine wet ingredients in a bowl, combine well and slowly start to add the dry ingredients until fully combined. All the ingredients should form a soft dough. Grease your pie pan and using your hands press the dough into the bottom of the pan. After the bottom is covered bake in a 350 degree over for 12 minutes. Keep an eye on it to make sure the edges don't burn! Using a hand mixer begin to slowly mix the cream cheese while slowly adding the each of the ingredients. Mix until all lumps are smoothed out and filling is creamy and consistent. Pour filling into crust mold and bake in a 300 degree oven for 70 minutes. Make sure it is fully cooked through using a toothpick. Let cool and chill in the fridge prior to serving. Enjoy!